Cook spaghetti according to package directions. Meanwhile, in a large skillet, saute shrimp and garlic in 1 tablespoon oil until shrimp turn pink. Remove and set aside. In the same skillet, saute mushrooms and onion in remaining oil until mushrooms are lightly browned. Stir in the tomatoes and tomato paste. Bring to a boil. Reduce heat to low. Add the shrimp, basil, sugar, oregano and red pepper flakes. Cook, uncovered, for 5-10 minutes or until heated through. Drain spaghetti; top with shrimp mixture. Nutritional Analysis: 1 serving equals 410 calories, 9 g fat (1 g saturated fat), 168 mg cholesterol, 379 mg sodium, 54 g carbohydrate, 5 g fiber, 28 g protein. This was okay. But it wasn't so good that I won't look for another, better recipe. My 2 yo wouldn't touch it, but my husband thought it was great. I was in the middle. 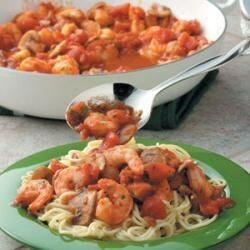 I was looking for a pasta dish with shrimp and red sauce, and this fit the bill. I really enjoyed the flavor of the sauce; it would be nice even without the shrimp. Fast and fresh tasting. This was pretty basic and easy to assemble. As with many recipes like this, it actually tasted better the second day when the flavors had a chance to all come together. This is by far one of the best shrimp pasta dishes I have ever made. Full of flavour. A keeper for sure!